Maliha A. brought a proceeding in the Family Court of Queens County before Judge John Hunt seeking an order of protection against her former boyfriend Onu M. Her petition claimed she had a bitter breakup and Onu was harassing her. Onu and Maliha had entered into new romantic relationships. Malihu had told a court attorney she was not afraid of Onu. At one point she sought to withdraw her application for an order of protection but at a later point she denied to the court that she wanted the petition withdrawn. Judge Hunt dismissed Maliha’s petition. It failed to meet the statutory burden rising to a level of a family offense. If an application is made to a court for an order of protection there must be a basis in law and the facts must substantiate the basis in law for a judge to grant this type of petition. Elliot S. Schlissel, Esq. 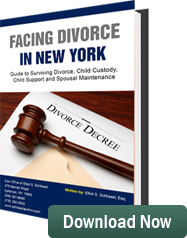 is a father’s rights attorney representing fathers throughout the Metropolitan New York area. He can be reached at 800-344-6431 or e-mailed at Elliot@sdnylaw.com.